It is not difficult to guess that the first of those quotes originates from the BBC in 2013. But, despite the reference to the 21st century avant-garde, it is difficult to believe that the second quote comes from the sleeve notes written for a 2011 CD release by a composer born in 1971. Spaniard Pablo Queipo de Llano is a self-taught neo-baroque composer, authority on Vivaldi, and member of Vox Sæculorum, an international society of contemporary composers dedicated to “the vindication of tonality as a current and valid language in Contemporary Musical Art” – yes, it really does exist. 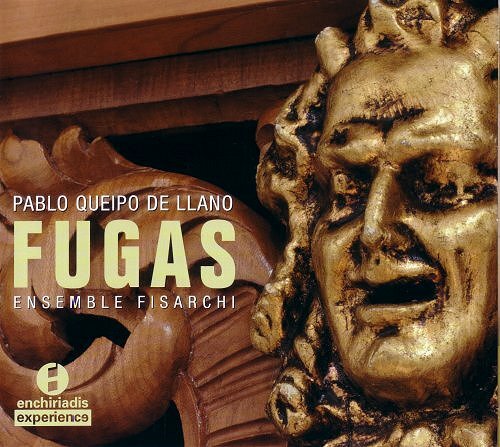 The passage is taken from Pablo Queipo de Llano’s note for the new CD seen above of his twenty-five four part fugues played by Ensemble Fisarchi on the Spanish Enchiriadis label. Despite the reactionary rhetoric - Queipo de Llano claims Elgar as a “neoclassical” composer and cites Eric Whitacre as an “exceptional landmark” in contemporary music – the results are really quite appealing in a neo-baroque Vivaldi-ish kind of way; there is an audio sample here. With timings ranging between 1’ 54” to 3’ 33” the twenty-five fugues are a godsend to the classical radio presenters among my readers who want tasteful fillers to replace the ubiquitous Slavonic Dances and Debussy Preludes. Pablo Queipo de Llano’s Fugas are pleasant enough in small doses. But like Antiques Roadshow concerts and Katie Derham they are most definitely not recommended in large doses. While writing this I noticed that Pablo Queipo de Llano shares his surname with Gonzalo Queipo de Llano (1875-1951) who was commander of the Nationalist Army of the South under Franco in the Spanish Civil War. Now a reader has also spotted the shared surname. Is it a coincidence of surnames? Or is there a link? How common is the surname Queipo de Llano in Spain? Can any Spanish - or other - readers help?